On 22 April, President Ellen Johnson Sirleaf signed an executive order - Executive Order 84 - which if implemented would see industrial fishing vessels given greater access to Liberia’s coastal waters. Amongst other things, the order cuts the country’s Inshore Exclusion Zone (IEZ) - reserved for local, artisanal fishers - from the current 6 nautical miles to just three, in a bid to “revitalise commercial and semi-industrial fishing”. While the Government of Liberia claims that the “local market is expected to receive more fish supply” due to the change, in turn limiting the need for imports from neighbouring countries, EJF and others, remains deeply concerned of the impact the move could have on both local fishers and the country as a whole. By opening the IEZ up to industrial fishing fleets, it is highly likely there will be an increase in competition from foreign vessels, applying for licenses to fish in Liberia waters in the search of the region’s high value species such as yellow croaker. While there could be some fish going into the Liberian market, EJF’s experience in West Africa has shown these high value species are usually exported to international markets - such as South East Asia - where they fetch a higher price. This is a huge risk in a country where 65% of animal protein comes from the fishing sector. The government has asserted that the “proper monitoring and regulation of the types of vessels, gear and fishing methods can… ensure that the twin goals of sustainable management and revenue generation can be achieved”. But, as demonstrated by the Yellow Card given to Liberia by the EU this week, the “national fisheries authorities do not have the information or means to control [its] fleet” at this time. EJF is concerned that under current conditions it is unrealistic that the government will be able to monitor the activities of the potential growing number of vessels fishing in its waters for unsustainable or illegal practices. In addition, the economic benefits for the government are unlikely to extend beyond the fees payable by vessels for fishing licenses. This will pale in comparison to the cost of the fish being lost from the local market. These warnings are being echoed by local fishermen. 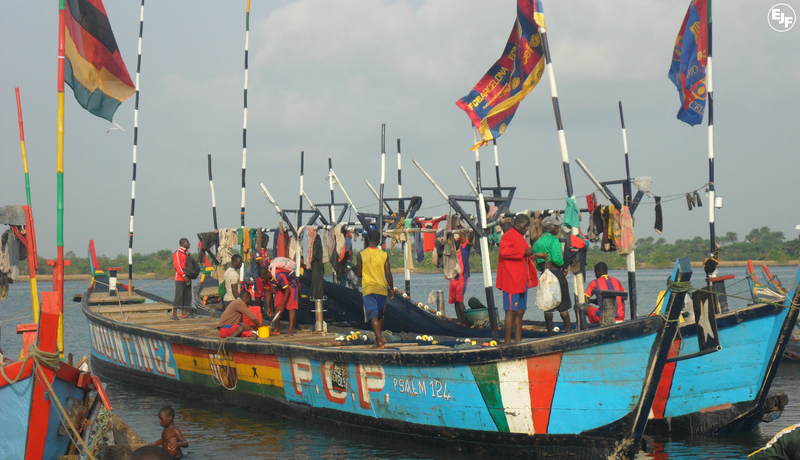 In Robertsport, the Community Management Association has warned the decision will allow industrial vessels to “steal the fish that we rely on to feed our families”, while the Liberia Artisanal Fishermen Association - representing some 350,000 citizens - has warned in a direct letter to the government that the decision “has the propensity to create serious hardship on the already poor and struggling artisanal fishermen”. According to the Bureau of National Fisheries (BNF) there are approximately 3,300 canoes and more than 11,000 fishers operating from 114 fish landing sites along Liberia’s 579km coastline. Around 33,000 people directly dependent on marine fisheries for their employment and income. Since the introduction of the six nautical mile IEZ in 2010, these local fishers have reported higher catch, increased incomes and a decrease in conflict with industrial trawlers which plagued their way of life in the 1990s and 2000s. Liberia’s coastline is long and it is unrealistic to expect the Liberian Government to be able to fully police the sea and prevent a return of such conflicts between artisanal and industrial vessels. Meanwhile, there is currently little scientific understanding of the size and state of fish stocks in Liberia’s coastal waters. There is a clear need for greater data collection before the Liberian Government opens the area up to more larger vessels, using potentially harmful fishing practices. The decision to do so is in contradiction to the precautionary approach of the FAO Code of Conduct for Responsible Fishing. While we commend the government for beginning the journey to revise its fishing laws to stamp out illicit fishing activities, there is still a long way to go to securing truly sustainable fisheries in the country. By halving the IEZ, the Liberian Government is rolling back, not re-confirming its commitment to securing the future of its coastal waters. Through reforms to date Liberia has become “the country with the healthiest fish stock in the [West African] region”. This cannot be an excuse to remove protection for its fisheries, but should instead be an argument for increasing its fisheries reforms further. We hope that the government will take note of these warnings, and will reverse the decision to halve it critical exclusion zone. Much like in 2010 with the introduction of the zone, protecting it now will be another critical step to protect fish stocks for local fishers, now and into the future.